Why the focus on Nurses? Primarily because from what I’ve seen of your pension plan, many of you will have good pension income when you retire. Many of you also work overtime which can leave you exhausted and at a higher tax bracket – so a lot of that extra money you’ve earned just goes to paying extra taxes. So how do you retire early when you know you’ll be getting a reduced pension? The answer is really in your take-home pay, after taxes. So learning different strategies to reduce your taxes is key. This includes different financial and business solutions as it’s even better when you’re able to do what you love to do for less. 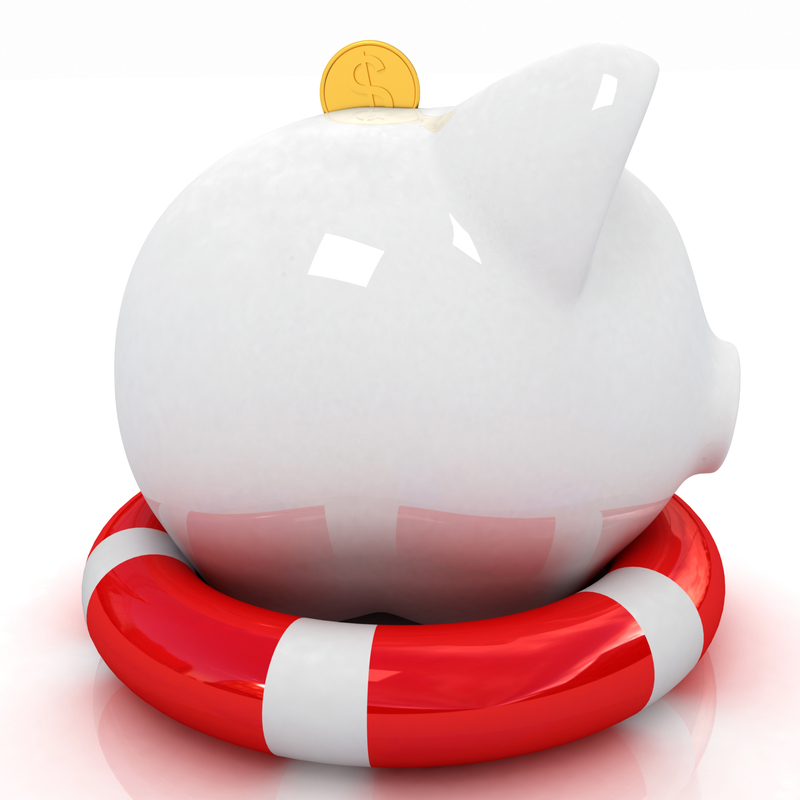 The workshops are personal because the conversation about specific finances are confidential. 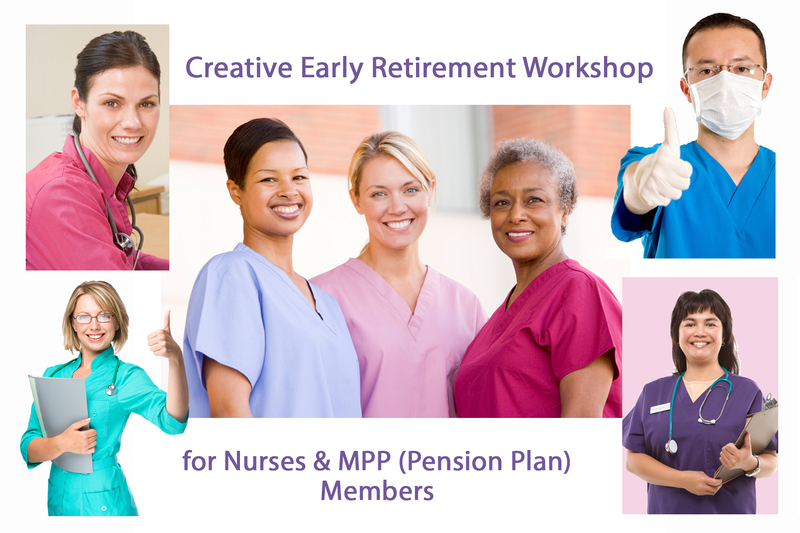 I’m also developing group workshops that cover more of the general concepts of creative retirement planning, then pairing them with a personal confidential consultation to provide you with a specific plan customized for you. 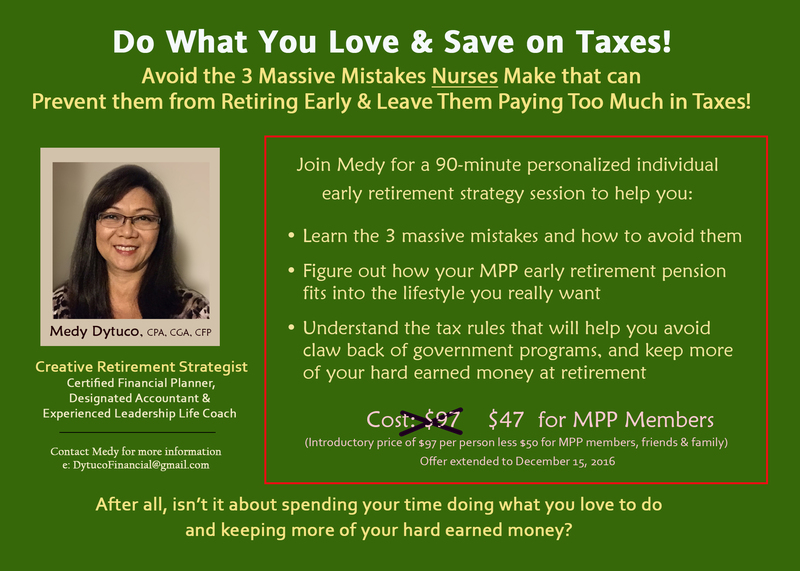 Learn the 3 common mistakes that professionals make that can prevent them from retiring early & leave them paying too much in taxes – and learn how to avoid them. Calculate what you’ll need to support that lifestyle, compared to what you’ll have at retirement (using your current pension & retirement savings numbers), to see what’s the gap (if any). Look at what you’ll need for the other stages of retirement (past the retirement honeymoon phase, when you settle down and later, have a higher risk of illness). Create a draft plan of how you can balance your taxable and non-taxable income to avoid claw back of government programs and loss of tax credits. Look at other financial & business solutions that would help you get the most out of your retirement income, while doing what you love, and preferably paying less taxes. A report showing calculations of your retirement savings with projected earnings, compared to your estimated expenses (with inflation) at retirement. An investor profile template that you can use to see if your retirement savings investments are aligned with your risk tolerance (what you consider as an acceptable level of risk balanced with potential for earnings). Recommendations on what other financial & business solutions can help you meet your objectives, such as earn supplemental income and save on taxes (for example, small business solutions you can explore based on your interests and experience). If appropriate, a basic business plan template that you can use to initially see the financial viability of your business ideas and how it fits in with your “dream retirement” picture.